Can Indonesian Golf Sink a Hole in One? The Indonesian government hopes to turn the nation into Asia’s hottest golf destination. For most tourists, Indonesia brings to mind things like beaches, watery rice terraces, volcanoes, and Jakarta’s heady urban sprawl juxtaposed with ancient temples and Balinese dance. Not to mention – on the dark side – fears of unrest and potential terrorist attacks. But if the Tourism and Creative Economy Ministry has its way, palm tree-fringed golf courses will soon be near the top of that list. According to a report published in The Jakarta Post today, the government body has announced its plans to make the archipelago Asia’s top golfing destination. The body’s promotional director Rizky Handayani added that the government has set a goal of luring 50,000 golfers in 2014, and is already actively pushing incentives to golf schools in turf-loving countries like Korea and Japan. Further, the ministry is teaming up with Indogolf Travel, Golf Wonderful Indonesia, and national carrier Garuda Indonesia, which allows passengers to lug their golf equipment onboard for no additional luggage charge. Wave chasers can also check-in their surfboards for free. This goal isn’t so far-fetched. The report states that the island nation is home to more than 140 golf courses featuring all manner of layouts. According to Achyarudin, of Indonesia’s 140-plus greens, 51 meet international standards and were conceived by prominent course designers, including Bob Moore, Greg Norman, Graham Marsh and Jack Nicklaus. The report notes that the island’s dramatic backdrop of volcanos, oceans, rain forest, and sweeping skylines only heightens the appeal of the destination for adventurous golfers. A quick look at Indonesia’s golf map gives a view of the island nation’s vast geographic range for intrepid golfers to explore. 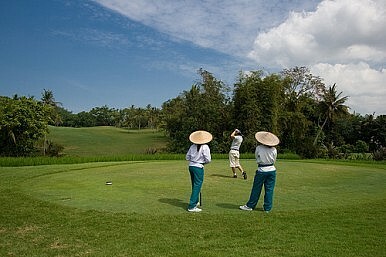 Nirwana has since become a touchstone for Indonesian courses and is rated as the nation’s best spot to tee off by many. As James Spence, author of The Finest Golf Courses of Asia and Australasia, notes, the trip to the course from nearby tourist towns feels like “somewhat of an expedition” and describes the course as being part “of that ingenious subspecies of golf courses, a course that looks more difficult than it plays…(with) plenty of do-or-die shots.” Rice fields, Tanalot Temple, steep shoreline cliffs – it’s closer to Indiana Jones than Caddyshack. Other Indonesian highlights include the remote Ria Bintan Golf Resort, designed by Gary Player and offering open seaside views with the chance to encounter wildlife – deer, wild boars, monkeys – from the jungle next door; and closer to civilization, Royale Jakarta, situated just 15 minutes from the center of the “Big Durian” as the capital is known and host to the Asian Tour’s Indonesian Masters in 2011 and 2012. These adventurous settings combined with country clubs and golf resorts could mean big money for Indonesia if the tourism ministry plays it right. According to the International Association of Golf Tour Operators (IAGTO), the global golf tourism market is worth more than $17 billion. Further, around 10 percent of the world’s 56 million golfers venture overseas each year to tee up. Achyarudin added that the average golf tourist to Indonesia drops anywhere from $2,500 to $5,000, compared with general tourists who spend around $1,133. The ministry is working hard to snag the interest of inbound golfers from Malaysia, Singapore, Australia, Korea, Japan, Thailand and China – as well as the coveted European market. But Indonesia faces stiff competition. Not the least of it is coming from China, which is home to a quickly growing number of golf-club-wielding “prodigies,” from Xie Chengfeng, who hopes to become the next Tiger Woods, to Guan Tianlang, the youngest golfer to ever compete in the U.S. Masters this April. The mainland is also rife with golf course overdevelopment that became so fierce at one point the Chinese government was forced to declare a moratorium on constructing new courses. Nonetheless, Indonesia will have a chance to shine this November when it hosts the Asia-Pacific Golf Summit 2013 in Jakarta. Time will tell if the nation’s vision for its greens is up to par.